In this blog, flood risk management engineer Rebecca Sharpe writes about why her role is rewarding and says girls and boys should be encouraged to get into engineering. I am a flood risk management engineer, working in Asset Performance. I’m based in Nottingham and look after watercourses in parts of the city and in Derbyshire. My role is incredibly varied. On any day it can include designing repairs to flood defences, speaking to members of the public about concerns in their area or visiting a river to collect survey information. I most enjoy the ‘problem solving’ aspects of engineering in my job, often a construction task itself can appear quite simple, but the challenge is getting access to a location and working with local people to understand the impacts and benefits for them. I joined the Environment Agency 6 years ago, on the graduate training scheme which encourages development towards Chartership with the Institution of Civil Engineers. I have always been well supported by colleagues and have been lucky enough to work on some great projects. Having started in a team looking at small scale construction works, I then went on a placement working with consultants to design parts of the Nottingham Left Bank Scheme, which protects over 16,000 properties. During the construction of the works I was based on site for 4 months and got to see some of the bits I worked on built. I learned a lot during this time about the interaction between the built and natural environment – flooding can be devastating to people and property. But our defences need to be built sustainably and fit in with their surroundings for the majority of the time when water levels are normal. Before joining the Environment Agency I worked with a major civil engineering contractor on a highways and bridge scheme, between studying for my master’s degree in civil engineering. I got into engineering because I had always been interested in how things work, particularly water and rivers. 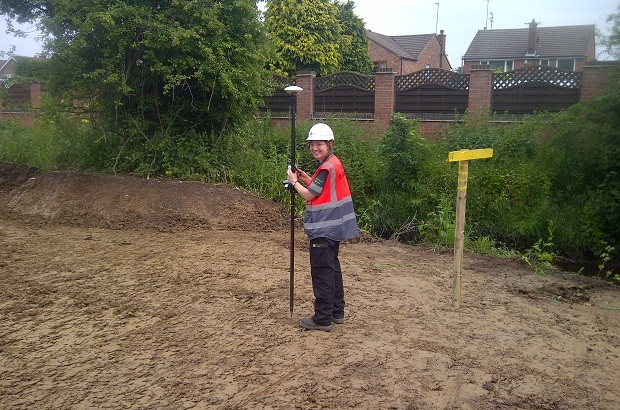 Civil engineering had the appeal of being able to work outside for some of the time. I find the work I do rewarding because hopefully it can make a real difference to peoples’ lives. I have completed my training scheme and recently gained professional membership with the Institution of Civil Engineers as a chartered civil engineer. To do this I had to provide evidence that I met a range of attributes, by completing reports on my experience and sitting a review. There was a lot of work involved but it was worth it in the end. I have always been keen to promote engineering to young people and have worked with schools as a volunteer STEM (Science, Technology, Engineering and Mathematics) Ambassador. It’s great seeing the inventiveness of the pupils as they solve challenges or answering their tricky questions, though talking during a whole school assembly was incredibly daunting! I think children need to be encouraged to be curious and hands on from an early age. Exposing girls as well as boys to construction toys, mud and the outdoors must be important. I have always been outnumbered by male engineers, but always had good support and largely have felt treated equally. I think the image of engineering is changing, and would promote it to any young people as a practical and rewarding career, whether they are male or female.